1. Quickly, give us the title and genre of your book in a 30-word or less tagline. 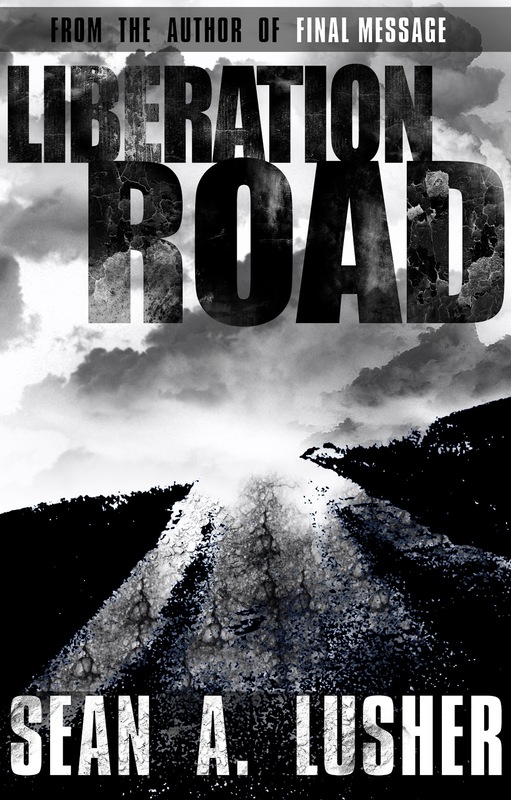 Liberation Road is a horror novella in which a routine stop at an isolated gas station quickly morphs into a grim tale of survival. 2. How did you come up with the title for your book? In all honesty, I came up with it randomly at work one day. I'd have to say the main character, Jared. Probably because he was easy to write. Everything about him felt natural and flowed accordingly. Johnny. Probably because he's the most underdeveloped character and he didn't have too much to do 'on screen', but I felt he was necessary for the story. 5. If you could change ONE thing about your novella, what would it be? Why? The length. I always end up wanting my works to be longer, and Liberation Road did turn out longer than I thought it would, but not by much. I'm still at a stage in writing where I want longer material, but am having difficult finding the delicate balance between lengthening the story appropriately and padding the prose. 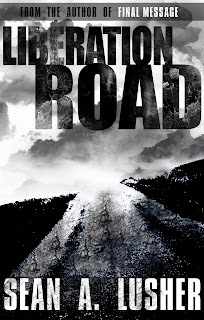 Ultimately, I felt that Liberation Road needed to be a novella, but in my ideal world, everything I write would be an epic length novel. 6. Give us an interesting fun fact or a few about your book. Well, the main character is how I could see myself being if I had never met my wife. I wrote the novella after seeing two teasers: the description for Stephen King's short story, Mile 81 and some gameplay footage of a game called Amnesia: The Dark Descent. I wrote the story in one go over the course of two weeks. Nothing springs to mind. Although almost everyone I come in contact with seems to think that being married at the age of 23 is a unique talent. My e-mail, for the moment, is obsidianproductions@hotmail.com. Although, in the near future, it will be at seanalusher@gmail.com. Alright, that might be embellishing a little. But while I may be primarily a horror/mystery author at the moment, I plan on expanding my work to encompass many different genres, from fantasy to comedy to science fiction to romance and, someday, when I'm brave enough, erotica. But as for the immediate future? I'm working on several horror projects to be release in the next few months. Readers: Take a chance on new authors. I know times are tough and money is tight, but with the advent of indie publishing and the Kindle, content is cheap. And legitimately skilled authors, previously ignored by the industry, are finally finding a way to have their voices heard. The more readers support writers, the better this whole thing will be for everyone involved. Writers: Unless the Big Six, or any publishing house, are offering you big bucks, don't bother. Sure, at first it might be great, but it'll come back to bite you, hard, when you realize you could be making 70% instead of 17.5% on royalties and reach a wider audience by controlling your own content and pricing. Several previously published authors, big names, are going the indie route or signing on with Amazon, who seems to know exactly what they're doing. Also, write often and befriend editors, marketers and cover artists if you can. 11. Is there anything you'd like to say? Well, definitely, thanks for having me, Jenna. These questions were fun to answer. Other than that, check out my blog for some free content. 12. And now, before you go, how about a snippet from your book that is meant to intrigue and tantalize us. Some bizarre cocktail of throaty noises escaped Jared's mouth as he regained consciousness. It happened all at once, very abruptly. Not like waking, some part of his mind observed with a detached apathy. No, not like waking at all. When coming out of regular sleep, Jared found himself doing it in stages--provided there was no alarm clock. Being unconscious was a completely different thing. His eyes snapped open as terror surged through his veins. He had a sideways view of a dim, dusty floor. Something was incredibly wrong, of that he was certain, but he couldn't tell what. He could remember the road. He knew he'd been driving down it for some time. And the gas station. Stopping there, nobody was home...Jared felt a gasp escape his throat as everything tumbled back into place. He snapped his head around, hunting for someone, his attacker. He was alone in desolate gloom. That thought seemed to register something, but Jared couldn't figure out what. All he knew was that he had to get out alive. As he began to pull himself up, a glint caught his eye. Something stashed behind and beneath the counter: a pistol. Almost without thinking, he grabbed it. Fear was a physical thing, screaming through his head, drowning out his sanity and reason. It put him on edge, sent tremors through his muscles. Thank you Sean for taking part in my Author Spotlight interview! I hope your writing continues to flourish and we hope to see more of you in the future.